Buy and Sell at the March 19 Guild Auction! The Guild Auction is a fun event and a chance to re-home yarn, fiber supplies and equipment. Perhaps you have a partial cone or two of weaving yarn that is languishing on a shelf or knitting yarn that just wants to be used by someone else. Now is the time to take a look at your fiber crafting supplies and see what still sparks joy to you and what should move on to someone else. To participate in selling your items, mark your items clearly with the form sent to members by email on March 5, 2019, or contact us to request the form. Please be kind to our treasurer and price your items in even dollar amounts. Two options are available for selling your items. The first is a “buy-it-now” price—the price you would like to receive if someone wants to purchase the item before the auction. The Minimum auction bid is the minimum amount you will accept as a sales price if the item goes to the auction format. In the past, many items have sold before the auction using the “buy-it-now” price. Please be at the church with your items to sell between 6:15PM and 6:30PM. If you are selling items, please check in with the treasurer and provide your current mailing address so you can get your proceeds. To purchase an item at the “buy-it-now” price, remove the item from the table and add your name to the sales slip. Circle the “buy-it-now” price. Any items purchased at auction will be handed to the purchaser to complete the purchaser’s name and the winning auction bid. At the end of the evening, please total your purchases and write a check for the total. You may pay in cash, but no change will be available. 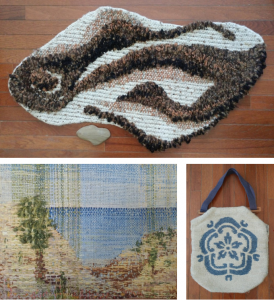 The auction is a great way to buy and sell fiber craft items. The Guild takes 10% of the purchase price of items sold. If you have sold items, a check for the sales proceeds minus 10% will be mailed to you. Posted on March 7, 2019 March 7, 2019 Tags Guild meetingLeave a comment on Buy and Sell at the March 19 Guild Auction! Imagine weaving freeform designs, like damask or brocade, using a 4-shaft loom, with no pick-up stick! Create your own two-dimensional design patterns using a simple threading and unique treadling system. In this two-day workshop, April 12-13, 2019, Nancy Marsh will teach the fundamentals of freeform twill, design theory, and how to make and use a cartoon. Once you know it, you can apply this technique to hand weaving everything from lightweight fabrics to heavy rugs. Learn more and register for this workshop today! Open to members and non-members. Students need basic weaving skills and to be able to warp a 4-shaft loom. While stormy winter weather over the weekend made it necessary to cancel our January 21 guild meeting, we look forward to our February 18 meeting and program on the technique and design possibilities of hooking with wool and other fabric strips. Stay warm!